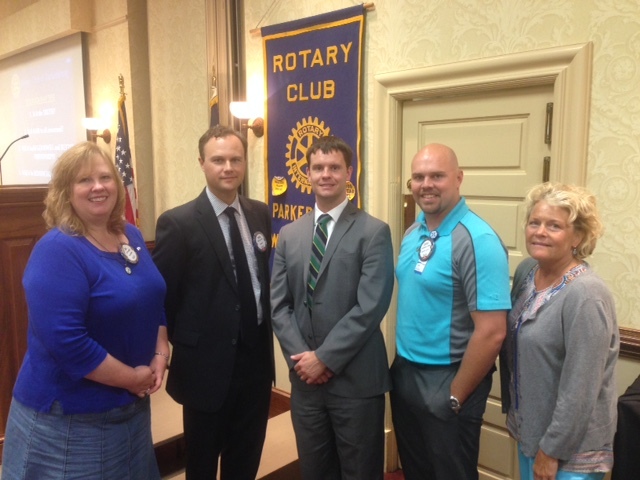 The Parkersburg Rotary Club recently welcomed two new members. Mike Lewis (second left) is joined by his sponsor Chip Ferrel and Chris Miller (second right) is joined by his sponsor Kim Couch. Club President Jill Parsons (far left) formally welcomed each to the club by presenting them Rotary pins and introducing them at the noon weekly meeting. http://parkersburgrotary.org/wp-content/uploads/2017/10/New-Members.jpg 480 640 admin http://parkersburgrotary.org/wp-content/uploads/2012/07/rotarycentersm.png admin2017-10-04 22:50:402017-10-04 22:50:40WELCOME NEW MEMBERS!!! Visit by Rotary District 7530 Governor Dave Whalen SAVE THE DATE! SOUR MASH!